Here it is: What we've been up to for over a month! The Friends find a way to get back together again after the Summer of Content comes to a stumbling, bumbling stop like Bobby Heenan in a weasel suit. After paying our respects to the "Brain", who was the chief donor to Heenan's Hall and thus its namesake, we dig out our Lists and proceed to choppee choppee our entries. Who's moving up? Who's moving down? Who's staying? Who's going? It's all right here, as we add, subtract, and alter our lists from #50 through #26! 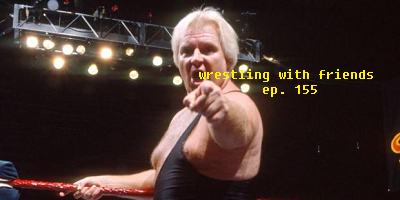 Join Andy, Blake & Erik, just a couple of friends chatting about wrestling. Won't you be our friend?